Comments: 70+ Feet on George Lake! Additional Features and Amenities Start your memories today in this George Lake home with 3 bedrooms, 2 bathrooms and over 70 feet of beachfront on a quiet end-of-the-road lot. The main level features various lakeside windows with a kitchen, dining & great room with a fireplace. You'll also find the master bedroom, walk-in pantry, laundry room, cozy sunroom, and four-season porch that could be used as an office all on your main level. The finished walk-out basement has two bedrooms, a family room, plenty of storage and a ¾ bath. 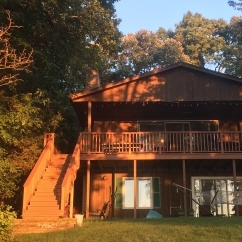 Outside you'll enjoy the great wrap-around deck with plenty of room for entertaining, grilling, beautiful sunset views, a spacious yard, a wooded two-acre lot adjacent to the garage, an outdoor storage shed, and a very private location provide lots of outdoor possibilities. Call today!